Travellers across the world are always on the lookout for thrilling experiences, new adventures and memorable stories. To fulfil all the desires of a globe-trotter, there is just one destination that provides infinite experiences – Gili Islands. It is a popular destination for tourists. The Gili Islands are an extensive group of three small islands or Gili Island triplets — Gili Trawangan, Gili Meno and Gili Air. From the thrill-seekers to newlyweds to the occasional traveler, Gili Islands offers the best of both the worlds. Once you travel to Gili Islands, you’ll get the first-hand experience of paradise. Located on the north-west of Lombok, these islands are isolated and give travelers a sense of purpose. Tourists are generally attracted to Bali as it offers a wide range of amusing scenic opportunities. But once they set their eyes on Gili Islands, they’ll have an enriching exploration. This is because Gili Islands tourism is much more enjoyable and pleasurable than Bali as a tourist destination. (Recommended Read: Indonesia is more than just Bali) When compared to Bali, Gili Islands offer much more. It provides a laidback atmosphere and is a gift to be cherished for those who love solitude. Tourists are destined to adore this hotspot for its pristine waters and coral reefs. Gili Islands are famous for its turtle conservation and brings a brilliant underwater experience for tourists. Apart from that, tourists can also enjoy scuba diving and snorkeling. The Gili Islands diving activities are a sure thrill as they provide an adrenaline rush. Travelling from Bali to Gili has now become easy; tourists can take the fast boat, which is the quickest and the most popular mode of transport. You can cross the Lombok Straight from Amed as it takes only 45-minutes and costs IDR 250,000. Then there are fast boats available at Padang Bai too, leaving between 9 am to 9.30 am. The public ferry from Padang Bai to Lombok departs every one hour and costs IDR 40,000. There are many things to do in Gili Islands and the attractions are overpowering. Tourists can never get tired of exploring amazing activities. There is something for everyone to enjoy. If you’re a food lover or a thrill seeker or someone who just needs a place to embrace the quietness, Gili Islands is crafted to bring fulfillment to anyone and everyone. Gili Meno–Popularly known as the most romantic getaway, Gili Meno is home to some of the best beaches. And newlyweds should definitely include this destination on their bucket list. If you’re looking to have a private affair, Gili Meno has some secluded resorts and bungalows. These are developed to bring the highest satisfaction. Some happening tourist spots include the Bird Park, the Turtle Sanctuary and the Meno Wall. 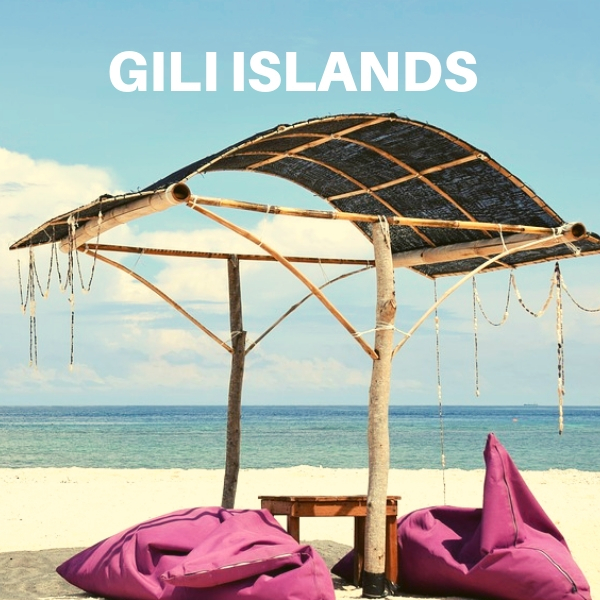 Gili Air –This destination is a delight as it offers nothing but the best of both Gili Trawangan and Gili Meno. From tranquil beaches to spectacular views, Gili Islands Holiday is the right choice for tourists, who want to indulge in a variety of Gili Trawangan activities. Sunset Swings –If you want the perfect social media profile picture, head to Gili T and Gili A, where Sunset Swings have their own charming appeal. Another Gili Island Attraction is the underneath graveyard, which is home to deal corals. Jiggy Boat – Gili Trawangan is known as the land where the party never ends. Jiggy Boat hosts larger than lifeboat parties, where party-goers just can’t get enough of swinging to the beats of the music. Bounty Wreck –The wrecks are home to lionfish, snappers, nudibranch and some beautiful species. So if the marine life fascinates you, then there is no better marine adventure than Bounty Wreck. Trawangan Night Market – If you live to eat, then visit the Trawangan Night Market. Here vendors dish out amazing local recipes and mouthwatering seafood delights that will keep you wanting for more. After some relishing sightseeing experience, you can energize yourself with a fresh seafood meal with sambal and rice…just what the locals do. Turtle Conservation Gili Trawangan – The Gili Island is popularly known as the turtle capital of the world. The conservation centre is private property and provides a safe environment for turtles to hatch their eggs before they are let off to the ocean. Tourists, who love nature and have a soft corner for animals, should definitely visit this place. The Gili Islands travel guide will help you with all the crucial information as transport is an important aspect of sightseeing; therefore you can rent cycles and tum-tumon the Gili Islands as no motor vehicle is allowed. Also, if Island hopping is on your mind, public fast boats are available on an hourly basis. Hence, boat rides make it easy for tourists to hop from one Gili to another. Our Bali Packages include Gili Islands and these are the best for newlyweds as the Islands offer memorable experience in all aspects, from thrill to adventure to romance, we cover it all for your benefit. Luxurious resorts, beautiful beaches, amazing underwater life, what else could one ask for. So indulge in an affair that’ll be a lasting memory for a lifetime. The Gili Island Tour is bound to make you revisit the place again because of its majestic appeal. Everyone knows Gili Islands overwhelms tourists with its attractions, but there are more delights to relish on. There are many 3 star luxurious hotels that not only make your life comfortable but also aid you with the best pleasures. Travel to Gili Trawangan and explore the beautiful Pearl of Trawangan Hotel, which was created to impress and express. The hotel has a rustic charm and what compliments it, is the tranquil environment. A trip to Gili Trawangan and you’ll thank your stars for bringing you here. Another 3-star hotel that brings an array of luxuries to life is PinkCoco Gili Trawangan, which is nothing less than paradise with a beachfront. Its upper rooms offer a view of the Lombok Strait. When one speaks of Gili Trawangan accommodation, Les Villas Ottalia is an opulent tropical villa complex that is located on Gili Trawangan Island. Tourists are in for a treat of a lifetime, once they check-in to this boisterous abode. The staff if requested can arrange Gili Trawangan snorkeling tour. In short, the Gili Islands is a magical tourist destination that gives you a wide variety of good surprises. So pack your bags and book your tickets to a destination that is always ready to welcome you and embrace you. Gili Islands works its magnetic appeal onto tourists as scores of people visit this tropical paradise every year as the Islands are filled with amazement.